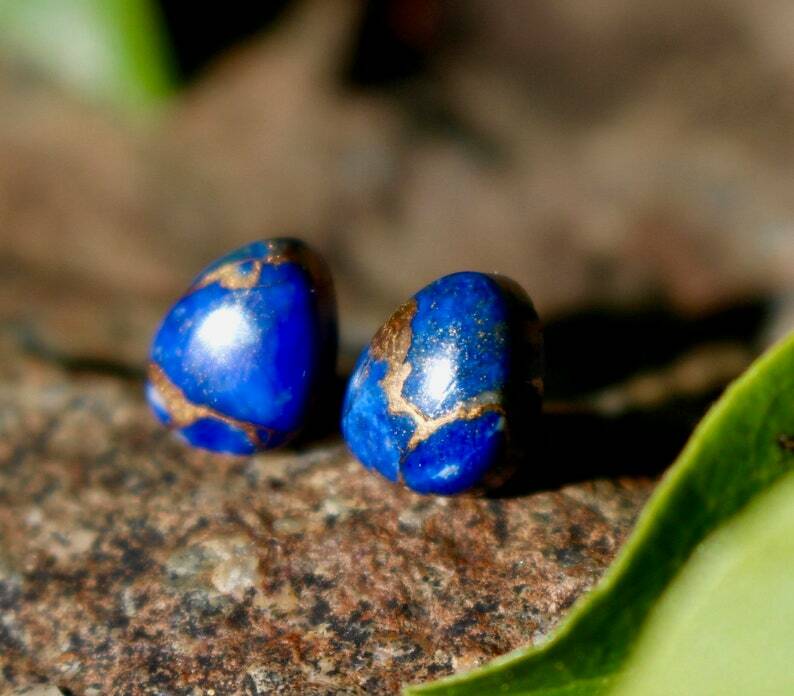 Dark and bold, but also delicate, these real Copper Lapis Lazuli stud earrings are perfect to dress up or dress down! Tiny and lightweight, these cuties are 7x9mm. They are cut in a nugget shape which is unique and playful! They are mounted on pure titanium posts, the pad is surgical stainless steel and the ear nut is plastic, so everything is hypo allergenic! We are passionate about hypo allergenic because our owner has ears just as sensitive as you! There is nothing worse than to find a CUTE pair of earrings that make your ears itch and burn! We hope these give you NO issues! This pair is easy on the ears! They are incredibly durable, double checked for strength and made with extra love! They are sure to get your lobes noticed! Try them on today and let us know what you think! Leave a review, share a pic and tag us on social media! We work super hard on all of our products but handmade items are perfectly imperfect. We think they are beautiful nonetheless! Please excuse any imperfections. Note: Please know your allergies! Don’t buy anything you may be allergic to! We do not offer refunds due to allergic reactions, but we hope you won’t have any allergic reactions to our titanium earrings. Get 25% off your order when you spend $20 at this shop. Discount shown at checkout. High-quality product, fast shipping, lovely seller - highly recommended! I love these earrings!! They are top-quality, and I can see myself wearing them in a casual setting or dressing them up. The seller wrote a really sweet message on the packing as well, and that totally made my day. I absolutely love these! They go with everything. We accept all payment methods! Yay! If payment is not received within a week, your order will be cancelled. We gladly accept returns and exchanges! We don't accept cancellations, but please contact us if you have any problems with your order. We do not accept returns due to allergic reactions. There is ample information listed on each items sale page to help you make an informed decision about your allergies. Buyers are responsible for return shipping costs. If the item is not returned in its original condition, the buyer may be responsible for any loss in value. We will ship your package to the address you have on your ETSY order! If you would like your order to be sent to another address - first add this address to your Etsy account and choose it for shipping during checkout. If the item is not delivered because of the wrong shipping address - the order won`t be refunded. If there are any issues with your purchase before shipping we will contact you immediately. Unfortunately, I cannot give any guarantees on a delivery date. An asterisk (*) shows an area without Delivery Confirmation. While packages generally arrive sooner, I allow the post office up to 2 weeks for domestic delivery and up to 4-5 weeks for international delivery before resending or refunding for non-delivery. Also, please remember that shipping around any holiday can be very unpredictable. IMPORTANT NOTE: International buyers are responsible for any and all customs charges, taxes, and additional postal fees. We cannot be responsible for delays if your package gets stuck in Customs. Customs Charges, VAT and duty fees are the responsibility of the customer and are not included in the price or shipping charges of the item. We complete a customs form when one is required. For details on processing time, please see individual items. Your happiness is our first priority! We rigorously test our earrings for durability and safety. Your feedback is very important and positive feedback is appreciated. If you are unhappy for any reason, please do not leave negative or neutral feedback. Contact us and allow us to try and resolve any issues! Our goal is your happiness! That is the goal! Titanium is VERY hypoallergenic so we use it for all of our posts. Other metal materials are surgical steel, sterling silver, copper or brass. We DO NOT use Nickel which is typically known to cause allergic reactions. Based on customer replies, we can say that 13 out of 15 customers have no reaction at all and can wear our earrings for multiple days at a time. 1 of 15 say they can wear them for longer than average but not a full day without a minor reaction. I did have an allergic reaction to these earrings. Can I have a refund? We are very transparent about our materials. We use about 4 items in each pair - Gemstone/Metal, Adhesive, Titanium, and Rubber Backs. With that said, WE CANNOT ISSUE A REFUND DUE TO ALLERGIC REACTIONS TO OUR PRODUCT. Please know your allergies and buy with confidence. Every item is a little different! Our products range from basically not wearing anything (lightweight) to I could feel this pair all day (heavy weight). Weight information is in the description and details page of every item. Please read the description or details to find out the weight estimate on each item.